The Hub Bicycles is hosting the Athens 3 vs. 3 Bike Polo Tournament. Group brackets for qualifying, top teams of each group. There will be a meeting of all competitors prior to the start of the event. Please make sure you are in attendance. - 10 minutes of play per game or score to 5. - Like touches like. Body against body; bike against bike; mallet against mallet. - Must hit end of mallet (small end) to score goal. You may pass with side of mallet. - Ball must go through the goal from field through goal posts to goal. If a ball goes through backwards, two people must touch the ball before you can score. Communal mallets will be available for use. 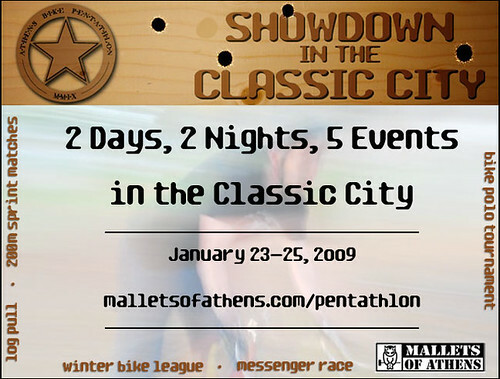 This entry was posted by Doug D on December 28, 2008 at 1:01 am, and is filled under Bike Polo, Events-Past, Georgia, Past Polo Events, Suggested Topics. Follow any responses to this post through RSS 2.0. Both comments and pings are currently closed. damn, that’s an ugly flyer. At least it has a flier. I’ve posted 3 other events this week that have no flier.